Another fine summer Sunday with useful cloud cover at times to keep away the heat intensity and we were down at Boston Manor but up on the top pitch close to the Underground line. A very basic site we chose the better of the wickets available and although Roehampton Bats won the toss, they decided we should open up and score first. Our openers this week were Chris who was available in his busy schedule and Jonners who actually took the first strike. Hunt and Maitland were the opening bowlers, both blondes with bun pigtails and deadly accurate, so much so that the first run was only earned on the 15th ball and the next stroke (past the boundary) was the 26th with a couple of byes in between. Play continued at slow rate until Jonners just could not nurdle one from Hunt and departed on 2 and the score at 15-1. Mendis, one of the vice, came in determined and we did at least reach 29 at the end of 10 and time to shout out the score, there was no board available. A change in bowlers now and their Captain Ed Davison and Brook pressed on but could not dislodge either and so Watson came in to bowl and by drinks it was 84-1. As the next over closed, Chris moved forward and was deftly stumped but he had 27 and Stuart replaced. He lasted five overs till the score was 123 but could not avoid LBW when on 9. Just as the score topped 150 in the 31st over with aspirations to reach 200 after all, Dom was also stumped, a sharp wicketkeeper. Walker was the last new bowler chancing his hand at each end as the the first bowlers used up the tally but could not get a wicket and conceded 40. Davison also conceded 43 including a fabulous six from Mendis that would have made a pavilion if there was any building in sight but he did have Stuart in his pocket. Newton came in but had not got into full drive before he was caught behind on a stretching catch off an edge. 178 and time for Mahender who soon pointed out that the opposition needed catching practice as he thrust the bat and ball to all parts. Mendis meanwhile had steadily plugged and was on 96 for a good while just looking for the boundary to cap the century deserved but Hunt got a low bounce under his guard and he was gone with the score now at 189. Now it was Niroshan to join Mahender and he swiftly exploited the holes he could find and swiftly reached 19 and Mahender 23 as the 40 overs finished and we had a worthy score of 226-6 after all. Niroshan had actually fielded 4 overs for the Bats to start as they had a player short/late so maybe his goodwill was also key reconnaissance. 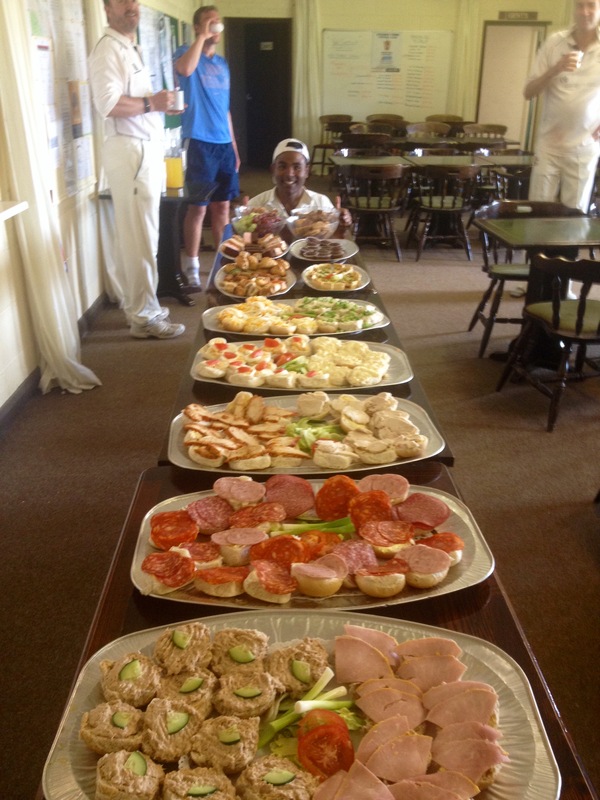 Tea was a splendid affair spread out near the boundary thanks to the efforts of Dom and also Matthew who had come solely for this purpose as he had a key function to attend later. A fine selection of sandwiches, snacks, pasta, nibbles, cakes, fruit and much more as well as tea brewed as wanted. Their preparation was steadily consumed and our visitors hardly wanted to get up to resume the match. Before the antics of the challenge, time to once again pass thanks to Noddy and Pat who had come along to give colleagues catching drills. Making sure nothing got by whenever faced with difficulty. We also had the delightful company of many supporters including Augusto, Anthony, Don and his dogs, Doug and many other friends of Stuart as well as a welcome contingent of our own players fresh from Vauxhall – Sam, Robin, Phil, Danish, Asad. This week Manish was opening bowler rather than third rotation and was partnered with the spin of Mamun against Nelson and Brook. Their score climbed quicker than ours but deft fielding and a long but deadly direct shot to wicket by Newton ensured a run out without score for Brook in Mamun’s watch and it was he who had the credit when Nelson went for 22 as Mendis scooped cleanly in the gully. Next over Manish got Davison in a fine piece of bowling and on his next over also took Dave for LBW and it was 37-4 in 11. There was a little stability as De Silva and Maitland played including a 6 from De Silva but now that Newton was bowling alongside Chris he got a well earned wicket to disrupt the flow and De Silva had a mere 16. Now it was time to watch Chris in action, always a graceful sight, but first Newton struck again getting past Coggins and then in the 20th bowled bowler Hunt before he could score. We took drinks briefly and then Watson earned a Golden Duck in that same over and it was all Farnham could do to avoid the hat trick but he did claim a boundary. 65-9 after 20 and surely the battle was won but then you hear so many times about heroic last wicket partnerships and with another 120 balls there was plenty of scope. Unfulfilled though as although Farnham did his best he was bowled, once more by Chris, at the end of the 22nd and it was all over for 75. A handsome victory, a little bit unexpected in the margin, that gave us a welcome boost on Pride Weekend. They are a friendly bunch that we shall we play again at 20:20 format again before long. Next week will be a tougher call as we play Piccadilly Pitchers at the excellent venue in Northwood. I could not close this report without disclosing that Mendis earned Man of the Match but he was closely run by Chris for his batting contribution and his 13-4 leading the other bowlers who were very economical, Newton on 13-2, Manish on 11-2 and in a full eight overs Mamun only yielded 33-1 and supervised a run out.